+1,000,000. This is the most effective strategy I've found for challenging ideas while in a public place and/or trying to socialize. Make comments about "wow, you're so confident, you must have really sat down and looked hard at your budget", "is there anything you'll have to give up for the house? I know that kind of thing can be worth it", "man, when the A/C breaks that's a lot of house to cool back down", "do you know who you're going to call for big repairs", "any idea, % wise, how much more utilities will be?" All said in a polite, interested tone of voice. Usually the other person changes the conversation when they start getting uncomfortable. This doesn't work on jerks who would turn it around and call you weird for asking so many boring/money questions, just live life man. Also works well to shut down the convo when MLM products come up. Ask them what's in in and how it works. Demand a specific answer. All with enthusiasm, as if if you could only understand how it worked, you'd of course buy some. Ahahahahaha! Well, I think I've just learned that I'm socially awkward. I usually behave that way out of genuine enthusiasm and a desire to understand. And to even give it a chance, and consider it. I wonder how often I accidentally make people so uncomfortable that they back down, when really I'm just trying to make sense of it and hoping to get excited. these are great questions, definitely gonna use them! I asked my wife if the MIL was pushing for a future room. The wife said no, MIL just thinks we need more space because our house is cluttered. Uh... how about we get rid of clutter instead? IT'S FUNNY HOW YOU THINK I NEED A FOURTH BEDROOM WITH TWO KIDS, WHEN YOU HAVE THREE KIDS, YOU HAD THREE BEDROOMS, AND YOU COMBINED TWO BEDROOMS INTO ONE BECAUSE YOU'RE SELFISH AND UNHAPPY. NOW YOUR KIDS HAVE TO SLEEP ON THE COUCH WHEN THEY COME HOME FOR CHRISTMAS. YOU BARELY SAW YOUR GRANDKIDS THIS CHRISTMAS BECAUSE YOU'RE ALWAYS WORKING OR SHOPPING WHEN YOU COULD'VE RETIRED TWENTY YEARS AGO IF YOU MADE BETTER DECISIONS. MY KIDS BARELY SAW THEIR GRANDFATHER EITHER BECAUSE YOU'RE MAKING HIM BUILD NEW SHELVES FOR SOME REASON. AND NOW YOU'RE PICKING OUT WHAT COLOR YOU WANT TO PAINT THE OUTSIDE OF YOUR BRICK HOUSE. YOU'RE PATHOLOGICAL AND INSANE! Painting brick? What is wrong with people these days!?!? We had an rental apartment where the brick wall was painted flat white around the fireplace. DW repainted it to have brick-ish sort of colors, with "mortar lines" included. Where we live, about every other house is painted. Most of them are painted... dark terracotta. You paint your bricks...brick coloured. 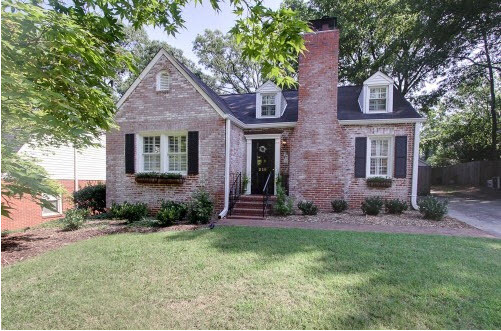 An unpainted brick or stone exterior is on my dream house wish list. I have not got time to be painting things I don't have to. Painted brick makes no sense to me either. and so many people have done it in our neighborhood. Nothing like ruining a low maintenance exterior. I had a house that had old indoor-outdoor carpet glued to the concrete front porch. Removing the glue was a nightmare! We had to remove glued down green outdoor carpet from a house we owned. Took a big grinder with a wire brush. Maybe a pressure washer would have worked. My BIL and his GF used to be frugal people and get all the stuff for their child second hand. But I get the impression now that they have started to change the last year. They now own 2 cars, although only one of them has a driver's license. One is electric for work and one is petrol for longer distances. They now have a house cleaner. They just went on a 4 week vacation to South Africa with their kids, last possibility to travel long and far before the eldest child started at school. I hope it won't continue in the wrong direction. My sister had a new subdivision built next to them. The houses all have painted brick. A few of the houses were built with one section of red brick, another section of tan, etc. and then just painted. So if (when) styles change and the new owners remove the paint, Surprise! Do you mean that these are brand new homes with painted brick? That makes no sense. Brick costs more, so why would you install it just to paint over it? I blame HGTV. Fixer Upper was probably the worst offender, but there are plenty of others. i suspect HGTV's corporate motto is something along the lines of "Change is Good". That's because leaving well enough alone doesn't generate any revenue. I wonder how many people don't use masonry paint and learn to regret it? I pretty much hate the look of brick and so when my mother painted their old brick fireplace mantel thingie white, I thought it was a big improvement. Then again, it was indoors and only used to store family photos, so it wasn’t exactly going to wear. Yes...new houses...new brick...painted! I do not see the logic either. My mom is a bit too frugal, at times. (I can't believe I am saying this... me thinking someone is TOO frugal...). 1) He really wants me to be safe and healthy, and this relates to an activity we do together. 2) I have just put in a lot of hours for free, for his side business. 3) He spends about 4x that every month just giving away cash and things to other people who randomly ask him (through his church).. in addition to his generous church donations. He called me up, and said that he would buy it for me, mainly because of 1) life safety device that he can afford, and 2) it would not be a Christmas present, and 3) he was happy to know something that I wanted (I never ask for things). Yay! right?! My mom calls 2 days later and says that she saw my request and they will get it for me, but it will be for Christmas plus birthdays for the next one or two years. ..um... yay? .... I think I would have preferred a straight-out "no" to this trickle-out plan. Maybe I should rescind it, but then I may stir up an argument between my parents... ah. First world problems. Could it be that they have to 'match' the amount with your siblings, and want to be fair? When I was making min wage and taking handouts from my parents, I decided to be transparent with them about my expenses. So I was explaining to Dad about my bills. Dad: Why are you so worried about an extra $100 here and there? You only need $3000/month to survive. Me: Dad, I make min wage. His jaw hit the floor. The idiot honestly thought min wage was $3000/month. My mother likes to make really emotional decisions - go back to school for a Masters in Arts, buy clothes and housewares on sale that she doesn't need, live paycheck to paycheck even though she's in her late 50s. Her favourite saying? "Money isn't everything". True, money isn't everything, but if you found other ways to feel good that didn't cost so damn much you'd be in a much better place financially. She's started using the phrase to guilt me for my choices. Things like moving across the province, having my own career, working two jobs to pay off student debt. According to her, I should work less, spend more, visit more often, and send her more gifts. Does brick cost a lot? Almost every house built 1950s and later in our city is made of brick. Housing is super cheap here in general, certainly including all the brick houses. And by now, a good third of them have been painted. A lot of the brick is really ugly, IMO, though I like the multicolored brick of our house (and we haven't painted it). Brick is much more expensive now relative to other exterior options. Back in the first half of the twentieth century, brick was between cheap to middle-of-the-road; stone was the more expensive option and wood or stucco was cheaper. With the advent of aluminum and vinyl siding, average prices fell dramatically, partly because aluminum and vinyl are cheap and partly because they're lighter and so don't require as much support from the foundation and exterior walls. If you wanted to build new, you'd be looking at around $5 per exterior sq ft for aluminum siding (installed), and about $15 per sq ft for brick veneer. If you wanted to do a full, real brick exterior, you'd be looking at more like $30 per sq ft, plus any additional structural costs, mostly because it takes about 100 hours of master bricklayer labor to do a 1,000 sq ft house. I live in one of those states. The insurance company was able to match my brick, but at my neighbor's house they had to remove and replace the entire exterior. I was kind of surprised that it only took about a week and a half, maybe. I have frequently found that people who say "Money isn't everything" use it as a defense mechanism to project their shame about being irresponsible with money onto those who are responsible with money. It's almost a type of gaslighting. I say it quite frequently when asked why I don't apply for a certain job here. The job would be about an 11% raise, but involves doing stuff that I'd rather gouge my own eyeballs out with a rusty spoon than do. "Correct. Money isn't everything. For me, doing meaningful things with people I care about is what life is about. The harder I save, the more time and money I have to do that." Good point. I don't think you're using the expression the same way Kelvin's mom is in the example above though! Saying "Money isn't everything and therefore I won't do what you want in exchange for your money" has a lot more integrity than "Money isn't everything and therefore you should give me your money!" Context is important. I do find that the majority of people who use the phrase are implying "... therefore you should give me your money and/or spend it on things that benefit me, particularly while I do nothing whatsoever in exchange to benefit you." To which you could reply, "It seems money matters more to me than it does to you, so why don't you just give me some of yours?" ... and yet they never see that irony. Years ago my SIL suggested to Mr. AccountingTeacher that we jointly buy FIL's house to rescue him from a lifetime of financial foolishness. I refused because I didn't want to effectively be in a joint venture with people who I knew could barely afford their own house, much less a second one, and I knew we would be left holding the proverbial bag. That's when I was first accused of only caring about money. @kelvin Are you serious about your dad thinking minimum wage was $3000 a month?! Please tell me more about your conversation after he found out it wasn't. @shelivesthedream He was serious. I've rarely seen him struck dumb like that before. He had a noticeable improvement in his attitude after that. He was more willing to help me with bits and bobs of money here and there, as he could afford, and stopped saying things like "well if you just budgeted properly...". He also stopped pestering me about buying a house, since he understands now that won't be happening for a bit. He's still incredibly foolish with his own money, but he never tries to guilt me for my choices anymore. Mom thrives on constant guilt trips. Her entire family seems to think this normal, acceptable behaviour. I haven't figured out how to shut down this particular line of thought, but you're right, this is absolutely about power, control, being "the good child" etc. Nevermind that I'm in my 30s and moved out ages ago. I'm currently working (getting paid overtime! To sit in my pjs infront of my work laptop!) and my SO's mother was horrified when she found out I'm working three weekends this month. I had shared the news as a good thing, because it is. Clearly I need to change my approach here. Anyone have any tips on how to politely talk around OT with suburban middle class folks? SO's family invite us out for things fairly frequently, so the fact that I'm working and can't go is going to be a recurring theme. My other half works shifts and has a side hustle during weekends/holidays so he's often not there at family gatherings. My family have accepted this by now, but they still pester him every now and then about when he's going to get a "grown up job". He's in his 30s and happy in his current job and I can't imagine him working a 9-5 office job ever. He's just not the type. The downside is that often they don't even invite him anymore because "he's not going to go anyway". They seem to forget it's not by choice. "I'm afraid I can't make that event, I'm working." Don't get drawn into it, it's none of their business how/why. You can add "I'm happy with the arrangement" if they start sympathising or asking questions. Lots of middle class people wind up working weekends sometimes. My husband is one of three brothers, and all three of the WAGS work some weekends, so all of my (solidly middle class) parents-in-law's daughter in/out laws do! My SIL is upper middle class, and works weekends occasionally lecturing/writing exams/marking papers for a university (in addition to to her main career, on the same topic). I'm working in a lower middle class career, occasionally there is overtime, and now I'm studying for a professional qualification at work as part of a promotion program, which means I'm often busy working/studying on weekends. The youngest brother's girlfriend is in a creative (design) career and is sometimes out of the country for a week or so with work. She also has a creative side gig at conventions, craft fairs etc on busy weekends. This is about my friend. She and her husband are in a lot of debt. They have credit card debt, car loan debt, thousands in lawyer fees still unpaid...etc. They cannot afford the mortgage, and so the husband's family has been paying for their mortgage and monthly child support since the summer of 2018. They are apparently going to file the documents necessary to claim bankruptcy as soon as they can afford the trustee's $1,000 filing fee. Despite their financial woes, they go out to eat (in nice, sit-in restaurants) every week. They went to Universal Orlando in December with their 3 kids, hired a professional photographer to take family Christmas photos, spent New Year's Eve in a fancy restaurant/bar located downtown in a high rise building overlooking the city fireworks show, and spent their 2 year anniversary in an even fancier restaurant. It seems their spending habits have not changed despite their high debt. Yanisimo - I guess that's how they got into that pickle in the first place. Some people never change. Classic example of how money does not solve money problems. When the family members that are paying their bills find out they are spending like this it may very well ruin their relationships. Lots of middle-class jobs involved working on weekends, or working irregular hours, or working extra when there's a crunch. I would think you could simply say, "Sorry, I have work I have to do." When you don't have work, come to events and enjoy them so it's clear that your absences aren't due to avoiding the family. Classic example of not being able to add 1 + 1. I'm pretty sure Yanisimo's relations would deny any relationship between their debts and their discretionary spending - which to them probably isn't something they see as discretionary either. The downside is that often they don't even invite him anymore because "he's not going to go anyway". They seem to forget it's not by choice. DH has run into this. Since getting his current job nearly 8 years ago, his work schedule has required him to work on holidays when there are family (his side) gatherings. They just don't understand that he has to work and take it personally when he declines. So in recent years there's been no invitations from this part of the family not just for the events he hasn't been able to attend but for everything. This has only been the case since taking the current job. Now for 17 years prior to this job his schedule was such he was able to attend on holidays, no problem. So by now they should know it's his job and he's not avoiding them but they insist on turning it into a big deal every time. Unfortunately, my parents have been very unsupportive of my plans to retire early. That is a petty. Parental support would have been nice. I am sure you will be a better dad by being more present for your children. This might also be a reason to not be too open about FIRE to relatives. By being open, they might get the wrong impression that you are mega rich and should be handing out money to them. Or that all your time might be used to take care of the parents. I told my FIL about our plans, who FIREd himself some decades ago. He thinks it is great that we are following that path. He also talked about that he didn't regret it at all. But we heard that he worked much longer than we had known. We are living abroad and don't know all that happens if they don't talk about it. I haven't dared to tell my mother about it, though. She might be more full of prejudices, although I am not sure about it. And she tends to gossip a lot about he to everyone she meets. My mother did also retire early herself, at 62 or so, in an official program that replaces elderly employees by younger ones and giving the pensioners extra compensation for that. Thanks @faithless @Imma. Part of the issue is that Ottawa is a government town. The vast majority of people here work for the Federal Government of Canada, which means they have an amazing union and some of the best benefits in the country. There's an attitude here that OT is a travesty, performed by American wage-slaves. My good old-fashioned "protestant work ethic" is raising a lot of eyebrows. It's important to me to "pass" as "normal", while actually having the freedom to do as I like. I'm not going to change how much money I spend or how I spend my time, but I want to float through the conversation without starting an argument.